A district council and NZTA agreement to form a business unit will save millions of dollars in road maintenance costs. But it’s a blueprint that won’t necessarily work in other regions, explains Gavin Riley. A local authority is forming a partnership with NZTA to manage all its road maintenance, a move expected to produce annual savings of more than two million dollars. Gisborne District Council and the Transport Agency have set up a business unit, Tairawhiti Roads, due to start operating from December 1. The unit will make savings by combining state-highway and local-road maintenance contracts, works contracts and renewal and resurfacing works. 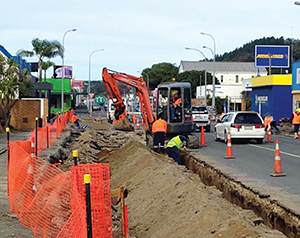 Work on the first stage of a $1.3 million, two-stage upgrade of Gisborne’s Childers Road. The project is due to be completed next March. From October 1 next year Tairawhiti Roads will adopt the agency’s new network outcomes contract (NOC), which will apply to Gisborne’s local roads as well as its state highways. The NOC will guarantee subcontractors a minimum of 20 percent of the work to ensure the needs of small local companies, and therefore the well-being of the local economy, are catered for. NOCs are to be phased in nationwide over the next two and half years. They are being awarded to primary suppliers and are performance-based. Tairawhiti Roads expects to make savings not only through the bundling of physical-works contracts but by smarter management, better decisionmaking, regional efficiencies, and in-sourcing the professional services functions of the council and the Transport Agency with additional support from the agency’s network outcomes group. The business unit will have 11 staff. Eight, including the general manager, will be employed by the council and three by the agency. Repairing a straight stretch of rural road in the Gisborne area. “The business case has projected annual savings of two to four million dollars per year,” says Gisborne District Council’s deputy chief executive and group manager engineering and works, Peter Higgs. He says the exact savings will not be able to be calculated until May 2015 when tender prices are known. 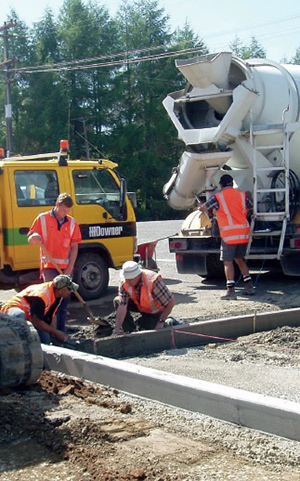 Gisborne’s current annual roading budget is $25 million, plus $17 million from the agency. The Transport Agency’s state highways manager Napier, Chuck Dowdell, stresses the innovative Tairawhiti Roads partnership – which has been almost two years in the making – does not necessarily offer a similar road-maintenance blueprint for other regions of New Zealand. He says the collaboration has been founded on Gisborne’s unique factors – no agency staff resident in the city, and agency and council consultants and contractors having to travel long distances separately to monitor and maintain the roading network. A large amount of duplicate engineering and operational time is spent travelling on the state highway to local roads due to the “fishbone” nature of the Gisborne network. Despite those factors, Dowdell says the formation of the business unit is not a matter of necessity. “It’s a matter of a better way to do business, and we’ve got a very good relationship with Gisborne council, always have had, so it made sense for us to do that,” he says. 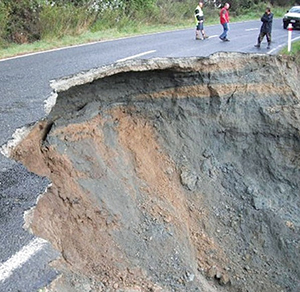 Gisborne’s roading programme includes its share of emergency work, such as this major slip near the Gentle Annie lookout in April 2012. Meanwhile, the Transport Agency is to increase its roading subsidy rate to the council from 58 to 60 percent. The increase is in line with the agency’s recent review of its funding assistance rates (FAR) (see box story “New subsidy rates”) and will mean the subsidy will rise to 59 percent in the 2015-18 national land transport funding round and to 60 percent in the 2018-21 round. Gisborne had been lobbying to have its subsidy rate raised because of the district’s deprivation index. Higgs says the index compares the relative wealth of each council’s area in accordance with population factors such as the number of people who have no access to a car or telephone, no qualifications, and who do not own a home. It also measures the number of people aged between 18 and 64 who are receiving a means-tested benefit and people living with an income below a recognised threshold. Ironically, the overall effect on the council of the percentage-points increase will be minimal. “This is because at present there are some categories, such as passenger transport, and capital and emergency works, that have higher assistance rates,” Higgs says.